Normally, when I teach, I use my own patterns and designs. They range the gamut from basics for beginners new to quilting and super simple designs specifically created to teach a technique to more complex “recipes” that leave enough room for each maker to bring his/her own voice and vision into his/her quilt. Every now and then, if I’m really crazy about someone else’s pattern and want to make it myself, I will suggest as a class. That was the case just a couple of months ago with Elizabeth Hartman’s Fancy Fox Quilt and last year with Cortney Heimerl’s Morning Star Quilt. 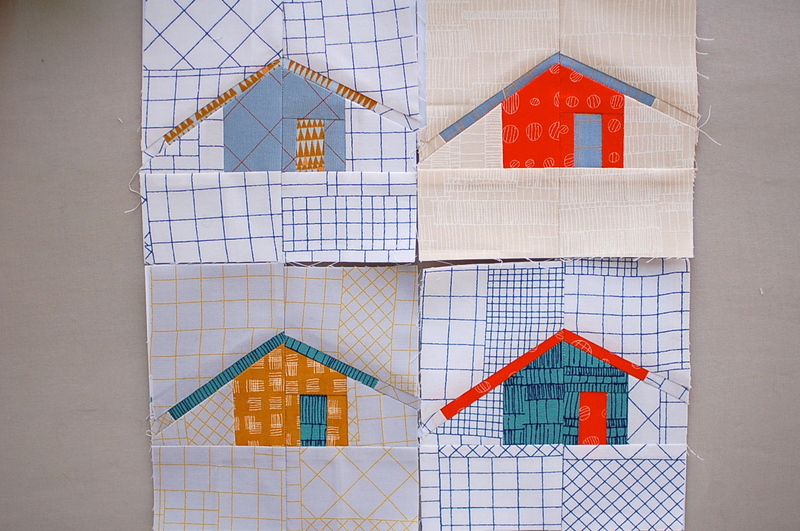 I’ve been meaning to try my hand at Carolyn Friedlander’s Outhouse Quilt for months. I finally bought the pattern at QuiltCon and am auditioning it now. What a wonderfully addictive paper piecing project! My son wanted to make this with me, so I had him cut the fabric while I pieced. By the by, paper piecing with a four year old takes a gazillion years. I could hear the ice melting and trickling away outside as I waited for him to finish meticulously cutting each and every piece. But in the end, it was so much fun! And aren’t these wee houses the freaking cutest? For the record, I am making the rest without the kiddo’s assistance. This project makes for perfect late night, relaxing sewing. Hah! At least they’re interested in the process. That curiosity and eagerness to “help” is how it begins. Soon they will want to start projects of their own. It’s great to see how it starts.